Nasal High Flow therapy has an increasing role across the hospital in the respiratory management of neonatal and pediatric patients. 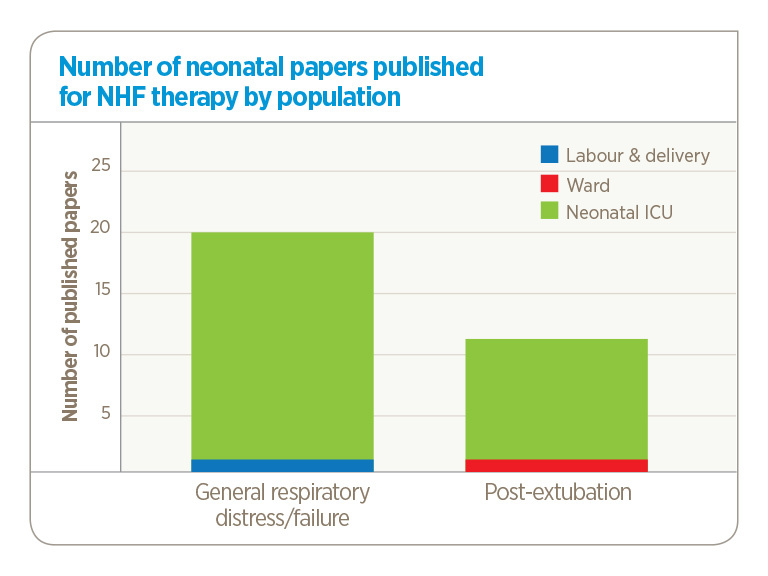 There is a growing interest in the use of Nasal High Flow in the neonatal and pediatric ICU, ED and Ward. 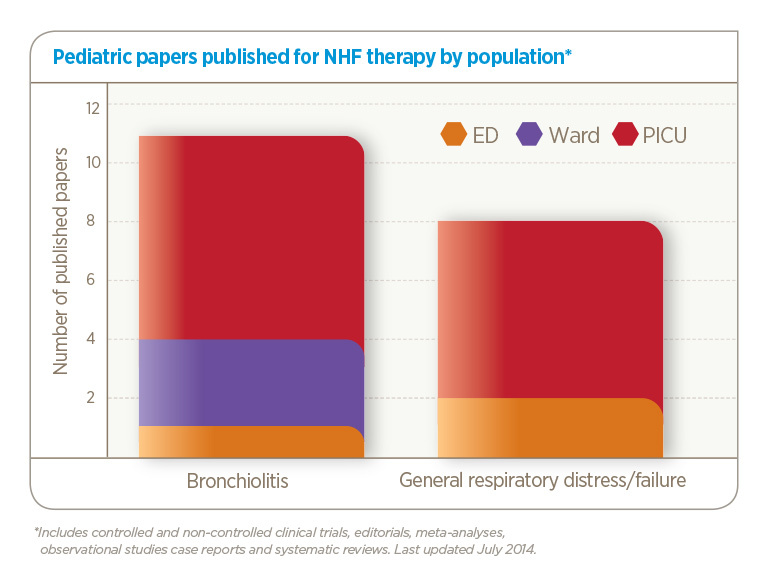 There have been more than 90 papers on Nasal High Flow published in the neonatal and pediatric population. As of 2015 there have been 5 randomized controlled trials published comparing Nasal High Flow to nasal CPAP with a total sample of 1195 babies1-5. Kugelman A, Riskin A, Said W, et al. A randomized pilot study comparing heated humidified high‐flow nasal cannulae with NIPPV for RDS. Pediatric pulmonology. 2015;50(6):576-83. In the neonatal population, the current body of literature has found that Nasal High Flow therapy has similar efficacy to nasal CPAP when used for post-extubation infants older than 26 weeks' gestational age. In addition, the use of Nasal High Flow therapy leads to significantly reduced rates of nasal trauma compared to nasal CPAP in this population group1,2,3. Literature supports the early and integrated use of Nasal High Flow therapy to optimize the patient journey. 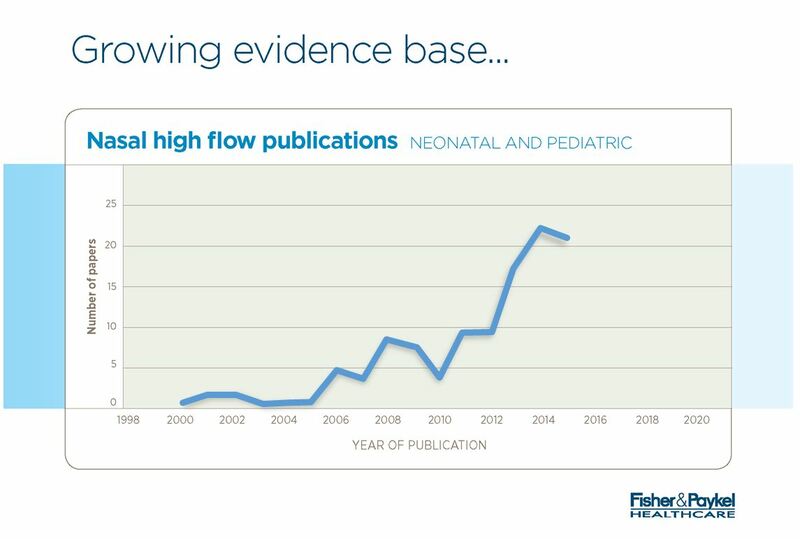 In the pediatric population there is increasing evidence supporting the early use of Nasal High Flow therapy in the Emergency Department and Ward4-8. Integrating Nasal High Flow therapy across the hospital has been associated with improved patient outcomes4,6,8. "The outcome results from this relatively large randomized trial indicate that the use of HHHFNC, as described in this report, appears to be as effective and as safe as nCPAP in this population of infants." Interested in evaluating Optiflow Junior in your unit, receiving updates or have an enquiry?